May 20, 2015 - 14 persons have been charged in connection with an alleged wide-ranging criminal conspiracy to violate airport security requirements and transport drugs throughout the country. In a criminal complaint partially unsealed, the baggage handlers were described as a drug trafficking organization determined to use the special access some of them had been granted as baggage handlers at the Oakland International Airport to circumvent the security measures in place at the airport. 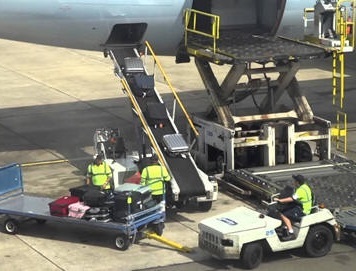 As alleged in the complaint, the baggage handlers entered the Air Operations Area (AOA) of the Oakland Airport while in possession of baggage containing marijuana. The AOA is an area of the airport that is accessible to employees but not to passengers who have completed security screening through a Transportation Security Administration (TSA) checkpoint. The baggage handlers were not required to pass through a TSA security screening checkpoint to enter the AOA. The baggage handlers then used their security badges to open a secure door that separates the AOA from the sterile passenger terminal where outbound passengers, who have already passed through the TSA security and screening checkpoint, wait to board their flights. The baggage handlers then gave the baggage containing drugs to passengers who then transported the drugs in carry-on luggage on their outbound flights. After arriving in a destination city, the drugs were distributed and sold. According to the complaint, the conspiracy was operating as early as July 2012. Baggage handlers Kenneth Wayne Fleming, 32, of San Leandro, California; Keith Ramon Mayfield, 34, of Oakland, California; and Michael Herb Videau, 28, of Oakland, California, are accused of using their security badges to cross security barriers while carrying unscreened baggage filled with packages of marijuana. They would then hand off the baggage to others, including Major Alexander Session III, 24, of Oakland, California; Clyde Barry Jamerson, 41, of Oakland, California; Kameron Kordero Eldridge Davis, 26, of Dublin, California; Ronnell Lamar Molton, 34, of Oakland, California; Francisco Manuel Carrasco, 29, of Hayward, California; Sophia Cherise West, 44, of Castro Valley, California; and others, who then would board outbound aircraft and bring the drugs to destinations throughout the country. Proceeds from the sale of the marijuana eventually were deposited into accounts controlled by Ahshatae Marie Millhouse, 27, of Oakland, California; Laticia Ann Morris, 40, of Little Rock, Arkansas; Donald Ray Holland II, 42, of Discovery Bay, California; and others. Mayfield used his privileges as an airline employee to ship drugs as cargo and have co-conspirators such as Brandon Jarred Davillier, 27, of Slidell, Louisiana, receive them for distribution. The defendants have been charged in a complaint with conspiracy to distribute, and possess with intent to distribute, 100 kilograms or more of marijuana, in violation of 21 U.S.C. § 846. Nine defendants were taken into custody in arrests coordinated throughout the San Francisco Bay Area and Arkansas. Eight defendants made their initial appearances on Monday before the Honorable U.S. Magistrate Judge Kandis A. Westmore, in Oakland, California. The defendants Holland, Fleming, Baker, Session, Davis and West were before the court on Tuesday. Defendants Mayfield and Videau are scheduled to appear on May 21, 2015, for detention hearings. Defendant Morris made her initial appearance in Little Rock, Arkansas, and was released on bond. Defendants Jamerson and Molton are currently serving state prison sentences in Arkansas and Louisiana, respectively, for possession with intent to distribute marijuana. Defendants Davillier, Millhouse and Carrasco are presently fugitives.